www.cheersonline.com 34 • September 2015 YEUNGLING LAGER D.G. Yeungling & Sons 12 Growth Brand Awards 2014 Cases sold: 6.3 million Like all the Hall of Famers, Yuengling Lager benefi ts from its history. Many customers know it as the oldest American-owned brewery, and one that has stayed in the same family for many generations. "Along with the quality of our products, we believe this message resonates with consumers," and helps the brand sustain growth, says Jennifer Yuengling, sixth generation in the family that operates the Pottsville, PA- based company. Established in 1829, D.G. Yeungling & Sons has grown to become one of the largest American- owned breweries in the country. The company operates three facilities: one in Florida and two in Pennsylvania. Yuengling added the second and third facilities between 1999 and 2000, when customer demand greatly outstripped the brewing output. The fl agship product is so popular in Pennsylvania and the Delaware Valley that it can be ordered just be asking for a lager. 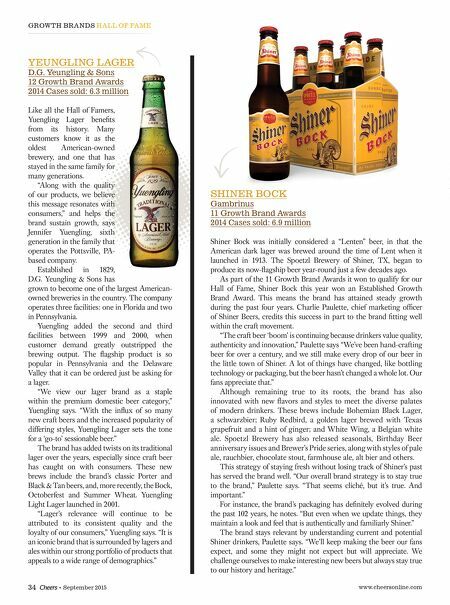 "We view our lager brand as a staple within the premium domestic beer category," Yuengling says. "With the infl ux of so many new craft beers and the increased popularity of differing styles, Yuengling Lager sets the tone for a 'go-to' sessionable beer." 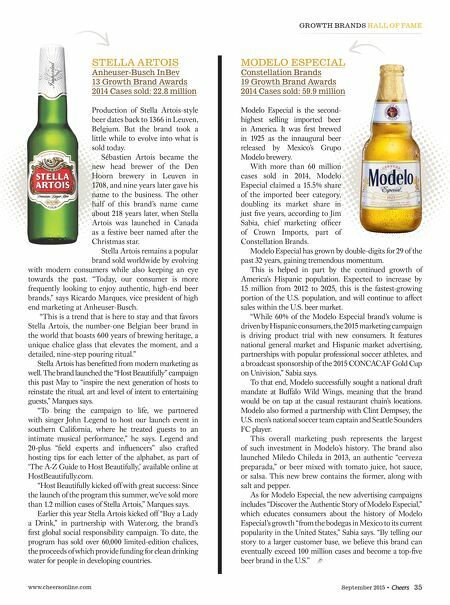 The brand has added twists on its traditional lager over the years, especially since craft beer has caught on with consumers. These new brews include the brand's classic Porter and Black & Tan beers, and, more recently, the Bock, Octoberfest and Summer Wheat. Yuengling Light Lager launched in 2001. "Lager's relevance will continue to be attributed to its consistent quality and the loyalty of our consumers," Yuengling says. "It is an iconic brand that is surrounded by lagers and ales within our strong portfolio of products that appeals to a wide range of demographics." GROWTH BRANDS HALL OF FAME SHINER BOCK Gambrinus 11 Growth Brand Awards 2014 Cases sold: 6.9 million Shiner Bock was initially considered a "Lenten" beer, in that the American dark lager was brewed around the time of Lent when it launched in 1913. The Spoetzl Brewery of Shiner, TX, began to produce its now-fl agship beer year-round just a few decades ago. As part of the 11 Growth Brand Awards it won to qualify for our Hall of Fame, Shiner Bock this year won an Established Growth Brand Award. This means the brand has attained steady growth during the past four years. Charlie Paulette, chief marketing offi cer of Shiner Beers, credits this success in part to the brand fi tting well within the craft movement. "The craft beer 'boom' is continuing because drinkers value quality, authenticity and innovation," Paulette says "We've been hand-crafting beer for over a century, and we still make every drop of our beer in the little town of Shiner. A lot of things have changed, like bottling technology or packaging, but the beer hasn't changed a whole lot. Our fans appreciate that." Although remaining true to its roots, the brand has also innovated with new fl avors and styles to meet the diverse palates of modern drinkers. These brews include Bohemian Black Lager, a schwarzbier; Ruby Redbird, a golden lager brewed with Texas grapefruit and a hint of ginger; and White Wing, a Belgian white ale. Spoetzl Brewery has also released seasonals, Birthday Beer anniversary issues and Brewer's Pride series, along with styles of pale ale, rauchbier, chocolate stout, farmhouse ale, alt bier and others. This strategy of staying fresh without losing track of Shiner's past has served the brand well. "Our overall brand strategy is to stay true to the brand," Paulette says. "That seems cliché, but it's true. And important." For instance, the brand's packaging has defi nitely evolved during the past 102 years, he notes. "But even when we update things, they maintain a look and feel that is authentically and familiarly Shiner." The brand stays relevant by understanding current and potential Shiner drinkers, Paulette says. "We'll keep making the beer our fans expect, and some they might not expect but will appreciate. We challenge ourselves to make interesting new beers but always stay true to our history and heritage."